In recent years, Ipswich has really made the most of its river with fabulous new attractions such as Bob Gamble Park. The previously unused riverbank areas along the Bremer are now home to the River Heart Parklands, of which this was unveiled as Stage 2. 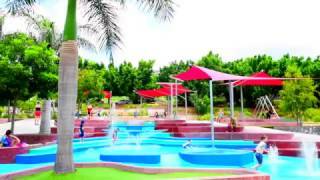 Bob Gamble Park, with its shade sails, has all you need for a cooling day out, with a zero-depth water park for the kids to splash around in and even ride their bikes through, and play equipment including a climbing spider. There's a 25-metre flying fox so youngsters can practise being Tarzan, and swings suitable for toddlers right up to long rope 'logs' for groups to ride. Add to that the thriving Discovery Forest with balance beams, forts, wooden totem poles and a bridge across a dry creek bed, and you won't be able to drag yourself or the kids away. There are ample picnic and barbecue facilities so everyone can satisfy the appetite they've built up with all of that energetic fun. Well-maintained toilets and showers are also on hand to make your day out one of complete contentment and comfort.